Prior versions of Windows included basic printer drivers that enabled simple printing when a full feature driver was not available. To reduce the Windows footprint and provide more storage space to users, these drivers no longer ship with the OS and instead are available through Windows Update. Until 1809, MS bundled most common printer drivers into install.wim. Starting with 1809 they’re no longer included, and must be obtained via WU. Why Did Print Scan Drivers Move to Windows Update? Here’s an interesting tidbit. “When you upgrade to Windows 10, version 1809, your installed printers will continue to work using the same printer driver as before.” This speaks to my long-held belief that the installer grabs and saves currently installed drivers from the pre-upgrade OS. Thus, it can make them available in the post-upgrade OS. New print drivers will indeed come from WU going forward, though. 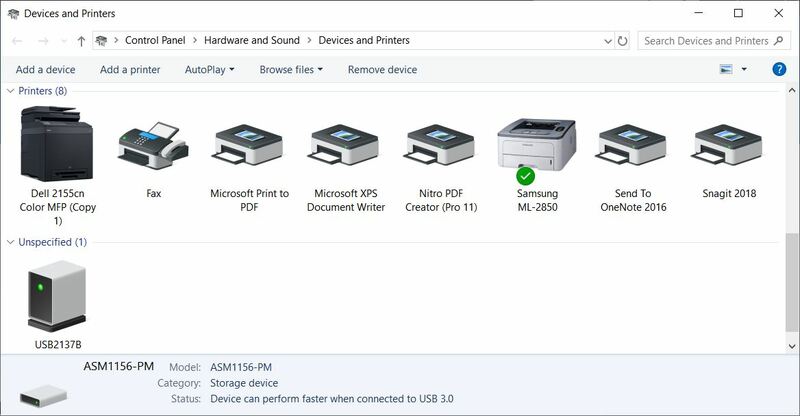 If WU isn’t available, drivers aren’t installed automatically for new printers (except for Mopria (“modern Wi-Fi printers”) compatible devices).